If you hear someone say, “I don’t know anyone who could eat a whole king-size Gym Shoe,” let’s hope you’re on Chicago’s South Side. Also known as a Jim Shoe, this massive sandwich is a neighborhood point of pride. And though it is delicious, and by no means made of athletic footwear, the Gym Shoe can be a bit hard for outsiders to swallow. A Gym Shoe starts with a hoagie, Italian roll, sub, or any bread of the sandwich shop’s choosing. That might sound like standard fare, but that’s kind of the point. Standard fare makes up the entire meal; it just happens to harmonize ingredients that most people never think to combine. To do the sandwich justice, the guy behind the deli counter has to create a cultural mashup. 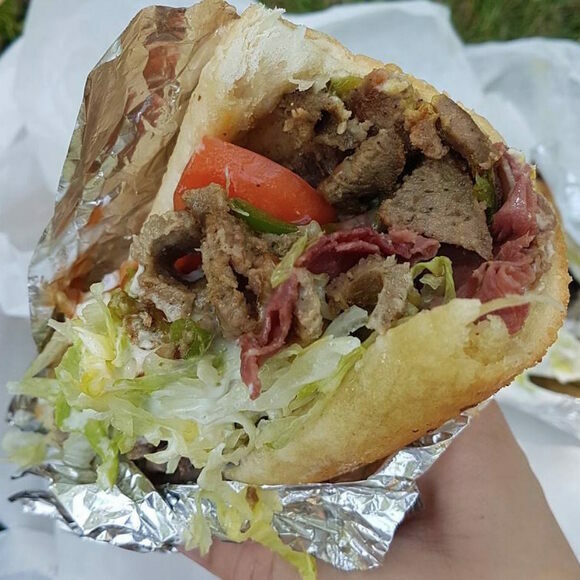 He shaves off Greek gyro meat, often lamb, from a rotisserie-style spit. Then he grabs handfuls of roast beef, a meat so English that the French have called Brits les rosbifs since the 18th century, and corned beef, a product of Irish and Jewish immigrant neighborhoods. The sandwich master piles all three meats onto the bread, sometimes crisping the beef in a hot skillet first. Next come layers of chopped iceberg lettuce, sliced tomato, tzatziki (a Greek yogurt sauce locally called GUY-ro sauce), and, occasionally, mayonnaise and mustard. But it doesn’t end there: Swiss cheese, onions, sweet peppers, and giardiniera (a hot, pickled Italian relish) are all fair game. Customers receive their gargantuan hodgepodge wrapped in aluminum foil and accompanied by a “can pop” (soda) and fries. Those who love sweet barbecue dip ask for “mild sauce” on the side. Although no one knows the origin of the Gym Shoe’s name, the sandwich’s own origin story reflects the diversity of the Windy City. Its melting pot of fillings arrived via European immigrants. And the sandwich itself was born on Chicago’s South Side—a neighborhood built up by the hundreds of thousands of African-Americans who left the South during the Great Migration. But all things considered and all flavors combined, the Gym Shoe tastes like one place, and that’s Chicago. Gym Shoes are sold primarily on Chicago's South and West Sides, though a few North Side sub shops keep the hefty sandwich on offer, as well. A favorite spot to grab a Gym Shoe. Now largely forgotten, the pairing was once as popular as PB&J.